1 Remove the outer leaves of the cabbage and cut out the stalk. Carefully take off the individual leaves. 2 Blanch in salted water for 3-4 minutes, then drain, refresh in cold water and drain well. Spread out the larger leaves on kitchen paper. Squeeze out the smaller ones and chop finely. 3 Soak the bread rolls in water and squeeze out. Heat 1 tbsp butter in a frying pan and sweat the onion, parsley and chopped cabbage. Season with salt and pepper and add the marjoram. Mix in the bread. 4 Place some of the mixture on each of the large cabbage leaves and roll up. 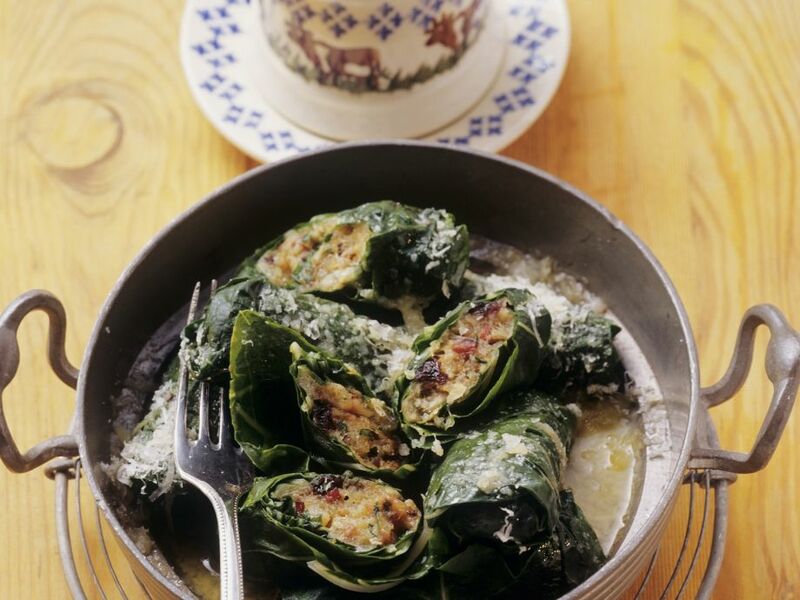 Heat the rest of the butter and gently fry the cabbage roulades for 10 minutes. 5 Add the tomato puree, rosemary and stock, cover and braise for 10 minutes. Serve with grated Gruyère cheese.